This region contains much history and many ancient mysteries and legends and interesting places and stories. The Gold of Tolosa is one of the good stories. Toulouse first appears in the history books around 24 centuries ago when the Celtic tribe Volcae Tectosages settled in the Garonne valley and called their main city "Tolosa". In the 3rd century B.C. Celtic armies had been attacking Greece. It is a longer story, but affairs were a bit messy, and it was a tempting target. Battles were fierce but ultimately the main Celtic force, lead by Brennos and Acichorios in 279BC more or less defeated the army of the combined Greek city-states at Thermopylai. The battles had however been very bloody, losses considerable, so instead of trying to push any further, they decided to just go raid the temple of Delphi, where immense riches had been collected for more than a thousand years, and make their way home. And despite obstacles and opposition, the Celtic force apparently managed to leave as quickly as they had appeared, with most of the treasure. All signs point towards that the greater part of this treasure ended up being consecrated by the Cimbrian Druids to their own gods, and that it was hidden in a sacred well in the main temple in Tolosa. 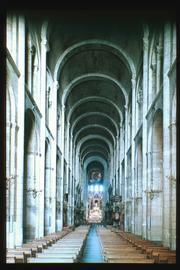 Which happened to be located approximately in the spot where today the Saint-Sernin Basilica stands in Toulouse. There the treasure stayed for many years. But Tolosa was a wealthy and flourishing city already then, and was located in a strategically convenient place, so it was only a matter of time before the Romans started becoming interested in it. Consul Q. Servilius Caepio plundered the town and the temple in B.C. 106 with a large army. And he dragged off the treasure from the well, planning to take it to Rome. However, they didn't get far. Cimbrian and Teuton armies engaged them and wiped them out. Caepio was defeated and 112,000 Romans and allies were left dead on the field. And the treasure vanished again mysteriously. Official history doesn't have anything to say about what happened to it. Nostradamus thinks it was miraculously restored to a good hiding place back in Toulouse, to be re-discovered at a later date. "In Toulouse, not far from Beluzer making a deep pit a palace of spectacle, the treasure found will come to vex everyone in two places and near the Basacle." Sounds a lot to me like a metro station on the new B line they're building, which happens to pass right by St.Sernin Basilica. Often, when they dig new subway tunnels here in Toulouse, they run into ancient ruins. So, lots of things might come to light. I might even find the treasure in my basement some day, who knows. Other people speculate that it might be the mysterious treasure that a priest seems to have found in the 1890s in Rennes-le-Chateau, rather than parts of a treasure the Visigoths took from the temple of Jerusalem, which is what is normally conjectured. And Rennes-le-Chateau is after all not far from where the Caepio was stopped in his tracks on the way towards Rome, so it makes some sense as a possibility. Based on this part of history and the fate of Caepio and his army, a Latin saying developed, "aurum Tolosanum habet" ("He has got the gold of Tolosa"), which essentially came to mean "His ill-gotten wealth will do him no good". Caepio became the poster boy for bad karma acquired from laying your clammy hands on treasures that aren't yours, instead of doing your job. So, I guess I've better concentrate on my own sources of wealth. If you are in the mood, somebody even made a game "The Gold of Tolosa", loosely based on this story. The lost dutchman's gold dosn't have the cold clammy hand part to worry about, lol. they argue that the treasure hidden here is the remains(or some of it)of the Templar fortune, never found when the organisation was crushed by the Pope and the king of France in the early 1300's. 10 Sep 2003 @ 04:54 by rainbowfish : "The Holy Blood,And The Holy Grail"
M. Baigent et al. (see above)claim that the Turin Shroud is a likeness of the last master of the Knights Templar, Jaques de Molay. "Jaques de Molay, thou art avenged!" ..in Quillan, nearby. She had a history teacher who she really liked and who taught her many things about life & living. Well one day years after, we met him on the street in Quillan and he told her that he'd at last 'found the grail' purported to have been located at Rennes le Chateau. He wouldn't say what it was and died about two months after (naturally, I hasten to add). So the mystery continues but that was what I heard with my own ears. in book cited above, the authors claim that there has been a mistranslation with regard to the grail. they argue that it was originally "sang real", or "royal blood". this they take to refer to the relatives of Jesus, who they claim emigrated to Marseille after the messiah was crucified. "Holy Blood, Holy Grail" is a great read. And "The Messianic Legacy" too. Might very well be something about it. The blood line thing makes sense to me. Apparently it wasn't just Jesus' blood line, but the blood line going back to David before him. ps changing the subject quickly, anybody ever read "Godel, Escher, Bach: An Eternal Golden Braid"? I've picked it up in the book store many times, but never got around to actually buying it. that the grail is metaphorical, not a literal cup.